After a lumbering first half, Peter and the Starcatcher rears into brilliant life. It’s great when it gets going – a beautiful exploration of the fragility of childhood and the joy of adventure – but it’s a shame that, given that it’s a Peter Pan prequel, and a fairly complicated one at that, there’s so much to set up before the fun starts. 13-year-old Molly (a charming Evelyn Hoskins) is a Starcatcher, entrusted with a secret mission by her sea-faring father – but when she finds a nameless orphan in the bilge (Michael Shea), her mission is all but forgotten. The ship is evoked through the trappings of poor theatre, the cast lining up to form corridors and decks, which feels by turns gorgeously inventive and a bit disingenuous in the face of the show’s obviously generous budget – it risks homogenising this style of performance by using it as set dressing. 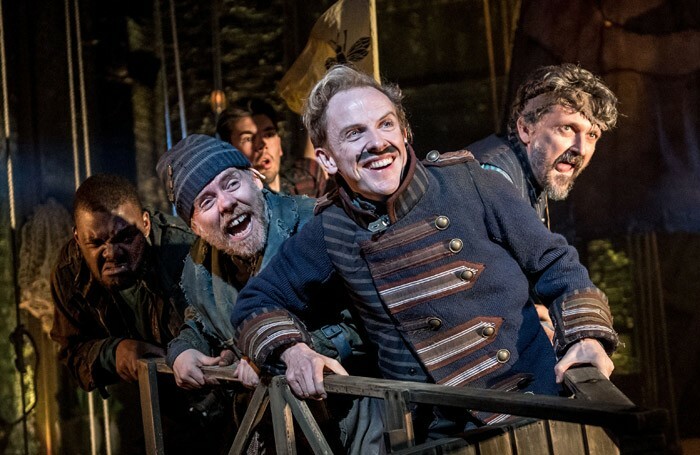 Luke Sheppard’s production zips along and is cheerful enough, but the show belongs to Greg Haiste as the ludicrously-moustachioed pirate captain Black Stache (think Hook as played by the late great Rik Mayall) and Dan Starkey as hapless sidekick Smee. They’re more on stage than off in the second half, which is one of the main reasons why the final hour is so relentlessly joyous. Rick Elice and Wayne Barker’s adaptation also manages to be clever and funny and desperately sad – with the purest sadness of Peter Pan itself: all children grow up. Except one.